This native, carnivorous fish is identified by the dark tab – without margin – over its gill (opercular flap) and a black spot at the base of its dorsal fin (A,C). 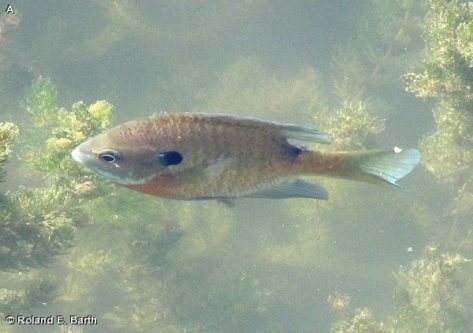 Bluegills typically have a lifespan of 4-6 years in a very small home range of less than 300 square feet. They can attain 16 inches in length, but they are usually much smaller. The one depicted in “B” was photographed off the pier near the blind on the Great Marsh in Fontenelle Forest, possibly a male guarding a nest in shallow water. 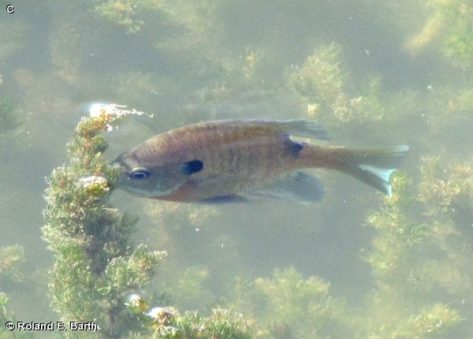 Bluegills spawn in June. They school in groups of 10-20. 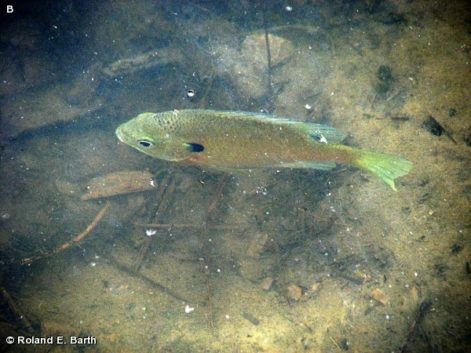 This small fish is considered common in the Great Marsh and in shallow water along Stream Trail in Fontenelle Forest. They can best be seen from shore early in the morning or late in the afternoon. They tend to hide in deeper water during the day.